New Year's Day is the first day of the New Year, following both the Gregorian and the Julian calendar. This Day is often marked by fireworks, parades, and reflection upon the last year while looking ahead to the future's possibilities. People celebrate the day in the company of loved ones, involving traditions meant to bring luck and success in the upcoming year. Communities and nations celebrate the Day in their own unique ways. Typically the customs and traditions of happy New Year's Day involve celebrating with enjoyment and a variety of different foods. The Day marks a date of newly found happiness. For many, celebrating New Year is their opportunity to learn from the prior year and make positive changes in their lives. While some festivities were simply a chance to drink and be merry, many New Year celebrations in other habitations were linked to agricultural or astronomical events. In Egypt, for instance, the year began with the annual flooding of the Nile, which coincided with the rising of the star Sirius. The Phoenicians and Persians began their new year with the spring equinox, and the Greeks celebrated it on the winter solstice. The first day of the Chinese New Year, meanwhile, occurred with the second new moon after the winter solstice. However, common traditions include attending parties, eating special New Year's foods, making resolutions for the New Year and watching fireworks displays. Celebrating the first day of a new year is an age-old custom. People all over the world mark the coming of a new year. They celebrate the New Year on different dates, and in different ways. Some ways are strange and unusual. May countries of the world civilizations have been celebrating the start of each New Year for at least four millennia. Today, most New Year's festivities begin on December 31 (New Year's Eve), the last day of the Gregorian calendar, and continue into the early hours of January 1 (New Year's Day). The earliest recorded New Year's festivity dates back some 4,000 years to ancient Babylon, and was deeply intertwined with religion and mythology. For the Babylonians of ancient Mesopotamia, the first new moon following the vernal equinox-the day in late March with an equal amount of sunlight and darkness-heralded the start of a new year and represented the rebirth of the natural world. They marked the occasion with a massive religious festival called Akitu (derived from the Sumerian word for barley, which was cut in the spring) that involved a different ritual on each of its 11 days. During the Akitu, statues of the gods were paraded through the city streets, and rites were enacted to symbolize their victory over the forces of chaos. Through these rituals the Babylonians believed the world was symbolically cleansed and recreated by the gods in preparation for the new year and the return of spring. In addition to the new year, Akitu celebrated the mythical victory of the Babylonian sky god Marduk over the evil sea goddess Tiamat and served an important political purpose: it was during this time that a new king was crowned or that the current ruler's divine mandate was renewed. One fascinating aspect of the Akitu involved a kind of ritual humiliation endured by the Babylonian king. This peculiar tradition saw the king brought before a statue of the god Marduk, stripped of his royal regalia, slapped and dragged by his ears in the hope of making him cry. If royal tears were shed, it was seen as a sign that Marduk was satisfied and had symbolically extended the king's rule. As part of his reform, Caesar instituted January 1 as the first day of the year, partly to honour the month's namesake: Janus, the Roman god of change and beginnings, whose two faces allowed him to look back into the past and forward into the future. This idea became tied to the concept of transition from one year to the next. In medieval Europe, however, the celebrations accompanying the New Year were considered pagan and unchristian-like, and in 567 AD the Council of Tours abolished January 1st as the beginning of the year, replacing it with days carrying more religious significance, such as December 25th or March 25 th, the Feast of the Annunciation, also called 'Lady Day'. The date of January 1 st was also given Christian significance and became known as the Feast of the Circumcision, considered to be the eighth day of Christ's life counting from December 25th and following the Jewish tradition of circumcision eight days after birth on which the child is formally given his or her name. The date of December 25th for the birth of Jesus is observed by the followers. In 1582, after reform of the Gregorian calendar, Pope Gregory XIII re-established January 1 st as New Year's Day. Although most Catholic countries adopted the Gregorian calendar almost immediately, it was only gradually adopted among Protestant countries. The British, for example, did not adopt the reformed calendar until 1752. Until then, the British Empire, and their American colonies, still celebrated the New Year in March. American Citizens often celebrate with a party featuring toasting, drinking and fireworks late into the night before the New Year, where the gathering counts down the final seconds to January 1st. Many English speaking countries play 'Auld Lang Syne,' a song celebrating the year's happy moments. Americans often make resolutions and watch the Time Square Ball drop in New York City. Although much of this celebration occurs the night before, the merrymaking typically continues to New Year's Day. Football is a common fixture on New Year's Day in America, usually the day of the Rose Bowl. Some foods considered "lucky" to eat during the festivities include circular shaped foods, black-eyed pease, cabbage pork. The Soviet Union's New Year's Day celebrations have been greatly affected by the Union's history. As religion was suppressed and Christmas celebrations were banned, New Year's, or Novi God celebrations often include Christmas traditions such as decorated trees, which were reconsidered as New Year Fir Trees. As the suppression left, these traditions stayed part of the New Year's Day celebration. The holiday is also celebrated with feasts, champagne, and wishes. In Russia, there once was a custom to tie the feet of people sitting at the table on New Year's Eve. This was to make sure that they would get together again at this table the following year. The celebration of the New Year is the most popular annual festival in Japan. At midnight, the bell rings out 108 times as a reminder of the 108 commandments of Buddha. Every person gets new clothes and takes three days off from work to visit with his friends. Each door is adorned with green pines, bamboos, red lobsters, crabs, and scarlet tangerines, standing for long life and happiness. People in all parts of India dress colorfully and indulge in fun filled activities such as singing playing games, dancing and attending parties. Night clubs, movie theatres, resorts, restaurants and amusement parks are filled with people of all ages. People greet and wish each other Happy New Year, Exchanging messages, greeting cards and gifts are part and parcel of the New Year celebration. The age-old tradition of planning new resolutions for the coming year is a common sight. A few of the most popular resolutions include losing weight, developing good habits and working hard. 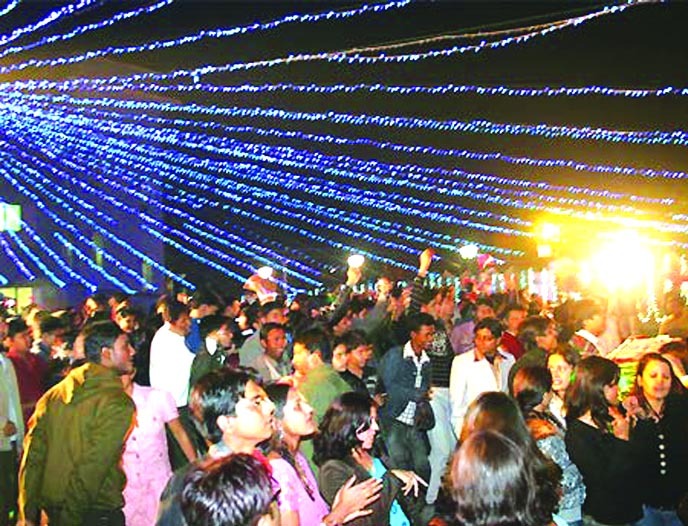 Large cities such as Mumbai, Delhi, Bangalore and Chennai organize live concerts which are attended by Bollywood Stars and other well-known personalities. Chinese New Year's festival lasts for two weeks. It is preceded by an expulsion of demons and by theatrical performances. The most exciting event is the "Parade of the Lanterns", headed by a huge dragon which is carried through the streets. As New Year's gifts, oranges are given and eaten as a symbol of good health. The French typically celebrate New Year's Day with a feast and a champagne toast, marking the first moments of the Day with kisses under the mistletoe, which most other cultures associate with Christmas celebrations. The French also consider the day's weather as a forecast for the upcoming year's harvest, taking into account aspects like wind direction to predict the fruitfulness of crops and fishing. In Philippines, celebrations are very loud, believing that the noise will scare away evil beings. There is often a midnight feast featuring twelve different round fruits to symbolize good luck for the twelve months of the year. Other traditional foods include sticky rice and noodles, but not chicken or fish because these animals are food foragers, which can be seen as bad luck for the next year's food supply. Greeks celebrate New Year's Day with card games and feasting. At midnight, the lights are turned off, followed by the Basil's Pie, which contains a coin. Whoever gets the piece of pie containing the coin wins luck for the next year. Spaniards celebrate New Year's Day with the custom of eating twelve grapes, each eaten at a clock-stroke at midnight. In old Denmark, people threw all their broken dishes against their friends' doors! The family with the biggest pile on their doorstep had to invite everyone for refreshments. In Nepal, a decorated wooden post is burnt, which represents the burning of the body of the Old Year. In some places of Southeast Asia people release birds and turtles to assure themselves good luck in the coming year. In Thailand, Buddhist monks are presented with gifts. Some people in Greece also play cards, hoping that a win will bring then luck for a whole year. In Italy people traditionally include lentils on the menu. Lentils are supposed to be lucky and bring money - perhaps because they look like small piles of gold coins. In Scotland New Year's celebration is the greatest festival of the year, where it even has a special name, Hogmanay. Nobody, however, can successfully explain where this word comes from. After midnight people visit their friends. They carry cakes and spiced ale to wish their hosts a good year. The first visitor, or the first footer, must bring a special present - a piece of coal - to wish good luck and warmth to the house. The first footer may also bring a loaf of white bread and a bottle of whisky. He may also carry a silver coin to wish wealth. In colder countries close to water, such as Canada, parts of the United States, the United Kingdom, and the Netherlands, it is customary to organize cold-water plunges. These plunges and races, sometimes called a Polar Bear Plunge, often raise money for charity or awareness for a cause. For thousands of years, New Year's Day has been a festival of rebirth and reflection, allowing people all over the world to celebrate another great year. New Year's Song "Auld Lang Syne," is sung at the stroke of midnight in almost every English-speaking country in the world to bring in the New Year. At least partially written by Robert Burns in the 1700's, it was first published in 1796 after Burns' death. Early variations of the song were sung prior to 1700 and inspired Burns to produce the modern rendition. An old Scottish tune, 'Auld Lang Syne' literally means 'old long ago,' or simply, 'the good old' days. The lyrics can be found here. Besides getting sloppy drunk and kissing everybody in the room at the stroke of midnight, celebrants throughout the ages have observed numerous lesser-known New Year's customs and superstitions. Some are mentioned here. The New Year must not be seen in with bare cupboards, rather larders must be topped up and plenty of money must be placed in every wallet in the home to guarantee prosperity. The New Year should not be begun with the household in debt, so checks should be written and mailed off prior to January 1st. Likewise, personal debts should be settled before the New Year arrives. The first person to enter your home after the stroke of midnight will influence the year you're about to have. Ideally, he should be dark-haired, tall, and good-looking, and it would be even better if he came bearing certain small gifts such as a lump of coal, a silver coin, a bit of bread, a sprig of evergreen, and some salt. Blonde and redhead first footers bring bad luck, and female first footers should be shooed away before they bring disaster down on the household. Nothing, not even garbage is to leave the house on the first day of the year. If you've presents to deliver on New Year's Day, leave them in the car overnight. Don't so much as shake out a rug or take the empties to the recycle bin. Some people soften this rule by saying it's okay to remove things from the home on New Year's Day provided something else has been brought in first. This is similar to the caution regarding first footers; the year must begin with something's being added to the home before anything subtracts from it. A tradition common to the southern states of the USA dictates that the eating of black-eyed peas on New Year's Day will attract both general good luck and financial good fortune in particular to the one doing the dining. Some choose to add other Southern fare (such as ham hocks, collard greens, or cabbage) to this tradition, but the black-eyed peas are key. Other "lucky" foods are lentil soup (because lentils supposedly look like coins), pork (because poultry scratches backwards, a cow stands still, but a pig roots forward, ergo those who dine upon pork will be moving forward in the new year), and sauerkraut (probably because it goes so well with pork). Make sure to do and be successful at something related to your work on the first day of the year, even if you don't go near your place of employment that day. Limit your activity to a token amount, though, because to engage in a serious work project on that day is very unlucky. Also, do not do the laundry on New Year's Day; lest a member of the family be 'washed away' (die) in the upcoming months. The more cautious eschew even washing dishes. Wear something new on January 1 to increase the likelihood of your receiving more new garments during the year to follow. Do not pay back loans or lend money or other precious items on New Year's Day. To do so is to guarantee you'll be paying out all year. Avoid breaking things on that first day lest wreckage be part of your year. Also, avoid crying on the first day of the year lest that activity set the tone for the next twelve months. Make as much noise as possible at midnight. You're not just celebrating; you're scaring away evil spirits, so do a darned good job of it! According to widespread superstition, evil spirits and the Devil himself hate loud noise. Examine the weather in the early hours of New Year's Day. If the wind blows from the south, there will be fine weather and prosperous times in the year ahead. If it comes from the north, it will be a year of bad weather. The wind blowing from the east brings famine and calamities. Strangest of all, if the wind blows from the west, the year will witness plentiful supplies of milk and fish but will also see the death of a very important person. If there's no wind at all, a joyful and prosperous year may be expected by all. Babies born on this day will always have luck on their side. New Year celebration is basically ending of the year and ushering a new year of hope and prosperity. Though many countries and cultures celebrate the day in different ways, their purpose is the same. We saw many national and international events round the year in 2018. Some are positive and some negative or even tragic. Despite all these, we can hope to have a better New Year.